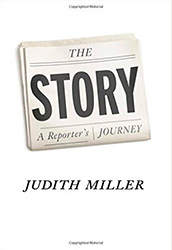 Star reporter for the New York Times, the world's most powerful newspaper; foreign correspondent in some of the most dangerous fields; Pulitzer winner; longest jailed correspondent for protecting her sources, Judith Miller is highly respected and controversial. In this memoir, she turns her reporting skills on herself with the intensity of her professional vocation. Judy Miller grew up near the Nevada atomic proving ground. She got a job at the New York Times after a suit by women employees about discrimination at the paper and went on to cover national politics, head the paper's bureau in Cairo, and serve as deputy editor in Paris and then deputy at the powerful Washington bureau. She reported on terrorism and the rise of fanatical Islam in the Middle East and on secret biological weapons plants and programs in Iraq, Iran, and Russia. She covered an administration traumatized by 9/11 and an anthrax attack three weeks later. Miller shared a Pulitzer for her reporting. She turns her journalistic skills on herself and her controversial reporting which marshaled evidence that led America to invade Iraq. She writes about the mistakes she and others made on the existence in Iraq of weapons of mass destruction. She addresses the motives of some of her sources, including the notorious Iraqi Chalabi and the CIA. She describes going to jail to protect her sources in the Scooter Libby investigation of the outing of CIA agent Valerie Plame and how the Times subsequently abandoned her after twenty-eight years. The Story describes the real life of a foreign and investigative reporter. It is an adventure story, told with bluntness and wryness.